The promptness with which the railways renames stations is missing when it comes to providing commuters with basic facilities, says Neeta Kolhatkar. 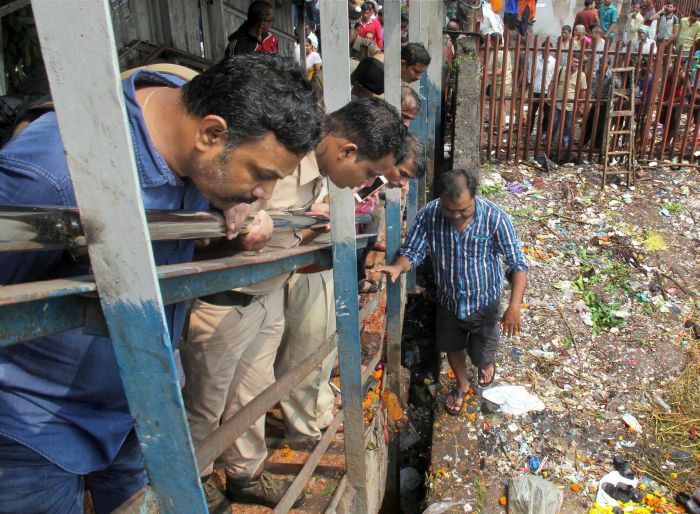 Image: People look on at the site of the stampede that broke out on Elphinstone Road railway station bridge in Mumbai on Friday. Photograph: PTI Photo. Friday’s stampede at Mumbai’s Elphinstone Road railway station, renamed as Prabhadevi road, was a tragedy that was waiting to happen. For five years I travelled to Elphinstone, to my former office, the Daily News & Analysis newspaper, and the station would scare me. It was evident to me, way back in 2005, that the south end bridge was way too small and it could lead to a tragedy. And today, that narrow exit saw 22 people dead in a stampede. It is pathetic how cheap human life has become in my dear Mumbai. I live in town, in south Mumbai that is, and the closest railway station to my house is Charni Road where the foot over bridge has collapsed twice already. The long bridge has finally been demolished, inconveniencing the commuters. There is no sign of escalators yet. The reality is that Mumbai's population has increased manifold, but the railways have failed to keep pace with this growth. In 2017, they are still to build escalators, and the old infrastructure like railway bridges and exits are ancient. Barely one person can ascend or descend at a time. The lakhs of commuters using Mumbai's local trains have served to focus attention on the poor quality of infrastructure provided to the millions who travel by train. Every day a person falls off the train for lack of space. Corporate offices refuse to accept late-running trains as a reason for late-coming and cut salaries, forcing people to board the overcrowded trains. They offer a quick mode of transport, yes, but the railways are doing no one a favour; it is a commercial venture. Numerous petitions have been filed in the high court against the railways, which keeps giving excuses for not implementing even basic infrastructure. The promptness with which the railways renames stations is missing when it comes to providing commuters with basic facilities. Forget the train blasts, every week incidents of attacks on women are being reported on our local trains. At some point the honourable minister and his officials need to feel ashamed for their failure in implementing simple safety measures. Scanners do not work, police officials are not alert to weapons. A colleague recently narrated how he has carried a knife on train a few times. So what needs to be done? The existing foot over bridges need to be widened, more east-west connectivity should be provided, as well as more exits for central-western line connectivity. Foot over bridges need to be well constructed and escalators must be installed in every station. People have a right to travel in dignity, and it is time railways provided it. Honestly, instead of Railway Minister Piyush Goyal setting up an inquiry committee, which is a time and money consuming mechanism, he should ask all local rail managers to submit their plans to augment existing facilities. Take stock quickly and announce immediate revamping of all facilities. Since the Bharatiya Janata Party government claims to be different from the previous one, this is its chance to prove it.